Local animal caretakers say they would need $150G on top of their regular expenses to achieve dream. The founders of the Animal Resource Center dreamed of building a no-kill animal shelter for the area when they mobilized six years ago. Today, they have an artist's rendering of the complex and 20 acres in Mount Pleasant Township, donated by a family last year. But the group's goal seems as far off as ever. "Our finances are really depleting," says Cyndi Lindenmuth, ARC's adoption and fund-raising coordinator. ARC leaders estimate the group would need an additional $150,000 in donations, above its annual fund-raising, to launch the no-kill shelter. Now, the volunteer club funnels almost all of its money into operating two kennels, which house about 60 dogs and cats, Lindenmuth says. ARC also boards animals at two other Bloomsburg-area businesses. Volunteers walk and feed the animals. They take them to veterinarians for shots and surgery. They "socialize" the animals, then adopt them out. Over six years, the group has sent 700 to 1,000 animals to new owners, Lindenmuth says. "When we get funds, we put it into the kennels," she says. "It's a Catch-22. [We're] not willing to not take in strays or animals just to set money aside. So we just keep plugging away until we get the money." 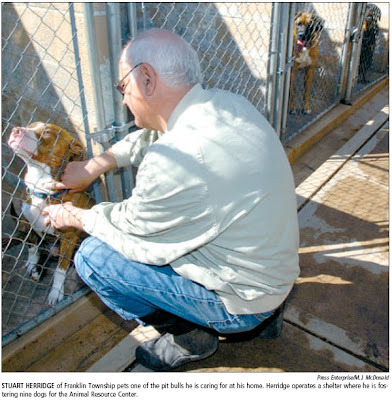 Stuart Herridge, who operates one of the kennels at his Franklin Township home, believes having a central shelter would be more cost effective than running the two kennels. Volunteers could administer shots, supply food and exercise the dogs all in one spot, he says. "What would be different is a guaranteed volunteer base," he says. "Members will feel like they own it. It's really difficult to see now where their money's going." Herridge estimates the ARC spends about $4,000 to $5,000 per month just in boarding animals. With a centralized shelter, the group could also begin spaying and neutering dogs and cats on site, Herridge believes. Now, they rely on adoptive owners to do that. If ARC discovers that the owner hasn't done so within 30 days, the group can take the animals back, under the agreement owners sign. ARC leaders say they have visited other no-kill shelters, like the Lycoming SPCA in Williamsport, the Hillside SPCA in Pottsville and Mostly Mutts in the Sunbury area. So they know how to make one work, Lindenmuth says. "I really, truly think if the public knew what we're all about, I think the public would help us out," she says. But the medical bills never seem to quit, she adds. "Every stray that comes in you don't know," Lindenmuth says. "So they all have to get shots." Chance, a deaf pit bull who's about a year old, needed surgery for a broken leg after the group received him from the SPCA more than a month ago. The surgery, which placed pins and screws in Chance's leg, cost $1,700. And there's still the chance the leg might have to be amputated. But the ARC has yet to pay for the first surgery. "We don't know how we're going to pay for it," Lindenmuth says. "We're still trying to figure out how to pay for it." Bilateral cataract surgery for another dog, Maria, a young cocker spaniel, may cost $2,600 to $3,000, she notes. So the group may elect to have the surgery done on only one of Maria's eyes. "We do try to cut corners when we can," she says. All those bills require almost continual fund-raising. The group has raised money selling shirts, hats, tote bags, dog bones, baked goods, pies and magnetic ribbons for cars. Volunteers hold annual basket bingos, yard sales and photo sessions with Santa Claus and pets. They're holding their first wine tasting at the Spyglass Ridge Winery in Sunbury, at $25 per ticket on April 29. The group also relies on loose change that donors put in jars at stores as well as its regular benefactors. And it holds occasional membership drives at $35 for adults. "We do whatever we can think of," Lindenmuth says. "We need people with ideas." All that adds up to about $80,000 the ARC takes in over the course of a year, according to Diana McFadden, the group's treasurer. That's also about how much the group spends, she says. But the work is worth it, Lindenmuth notes, when the group places the animals in loving homes. At the group's almost monthly Adopt-A-Thons, about 60-70 percent of the dogs and cats are adopted. "But in no time [the kennels] are full again," says Herridge, the kennel owner. Both Lindenmuth and Herridge bristle when asked if they should be devoting time and money to helping people rather than animals. Herridge said that outlook is a "bit narrow-minded." "These are like living creatures that God created, too, and I think it's our responsibility," he said. "We're supposed to be a humane species." Lindenmuth says that if you want to focus on making your life better, one way is to bring an animal into your life. "It's been proven to lower blood pressure. It's therapy," she said. "Animals can do a lot for people if they just stop and think." Reporter Simon Shifrin can be reached at 387-1234 ext. 1319 or e-mailed at simon.s@pressenterprise.net. The Animal Resource Center currently boards dogs and cats at two kennels, one in Franklin Township and another in Mount Pleasant Township. Anyone interested in adopting pets from the ARC can view its animals on the Internet. Go to 1-800-save-a-pet.com or petfinder.com and type in the 17815 ZIP code. Adoption coordinator Cyndi Lindenmuth says folks from as far away as Canada have inquired about the ARC’s animals through those Web sites. But the group doesn’t hand over the animals to just anyone. “If we are not comfortable, we really grill them,” Lindenmuth says. New owners must sign adoption contracts that require them to get their animals spayed or neutered within 30 days. Volunteers also check up on the adopted animals. 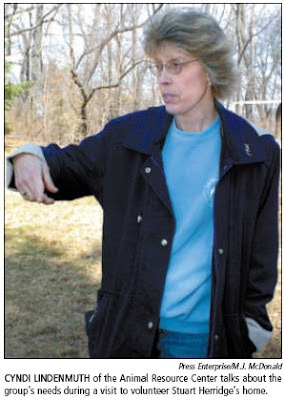 For owners that are having trouble reining in their new pets, professional trainer Eileen Drummond volunteers to help get the animals under control, Lindenmuth says. If problems persist, the ARC may ask to take an animal back. “We try to work everything out first,” says volunteer Stuart Herridge. “We suggest maybe the dog should come back to us.” The ARC has asked only a few owners to give animals back over six years, he says. “They’ve not been happy, but we’ve done it,” he says.